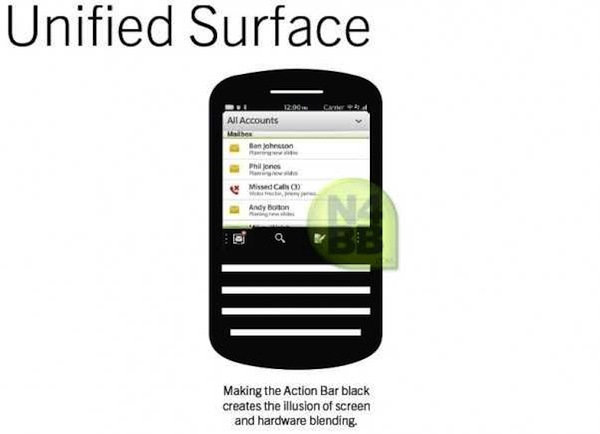 We've had a busy week with BlackBerry 10 leaks coming in thick and fast. Today N4BB brings us another, this time with more rumored details about the screen technology Research in Motion is planning to use in the next batch of smartphones released. Clearly, none of this has been confirmed by RIM, so please remember that until the facts are the facts, things are liable to change. According to N4BB; the reasons behind the decision to go with OLED are a lot to do with power consumption. The darker the screen, the less drain the screen has on the battery; so using pure black will optimize power. Again, themes have been mentioned. Having the option of a dark theme will be a warm welcome to many if it means greater battery length. The leaked document compares screens to a flashlight. Of course, the brighter the light you are emitting on your flashlight, the greater the strain on your battery. The same theory applies to phone screens. Clearly the above makes a lot of sense; in particular with regards to a full touch screen device where we know battery drain can be a real issue. This has been proven in many Android devices, although things seem to have settled down a bit now. Battery life on a BlackBerry has traditionally been great so it is encouraging that RIM is still striving to maintain that high standard. If these OLED ‘rumors' are true and battery life is utilized to the max I for one will be a happy customer. Let's see what further leaks we get prior to the official launch. I suspect there will be many.